The first “fire-proof” reinforced concrete building in the region, the Bunn Building once housed a theatre, pharmacy, and a National Five and Dime Store. I was under the impression that it was being restored, but apparently, this is not the case. Update: Danny Yarbrough writes: Bill Gross Construction of Kingsland…will begin restoration mid-2019 and restoration will take approximately one year. We were about one year away from completely losing this building to demolition! 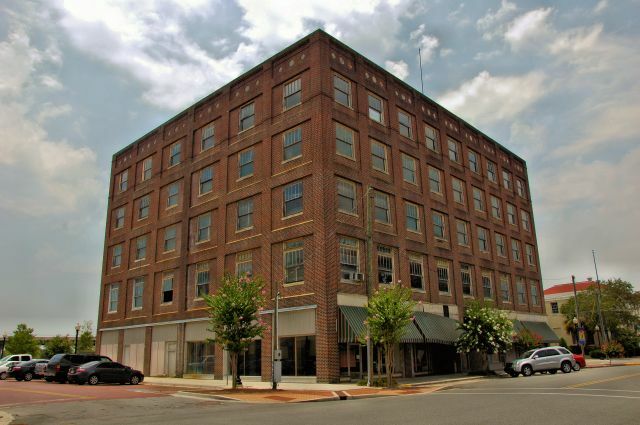 The Bunn Building in Waycross is under contract from a new buyer who is applying for tax credits through the Department of Community Affairs in Georgia. It will be historically rennovated into 50 apartments should the application be approved and work would begin mid 2019. In addition, negotiations are ongoing for the purchase of the Lyric Theatre building across the street for re-development. Oh, I hate to hear that. I was told wrong! Bill Gross Construction of Kingsland, GA has been awarded the tax credit project from the Georgia Department of Community Affairs as of November 16th, 2018. He will begin restoration mid-2019 and restoration will take appx one year. We were about one year away from completely losing this building to demolition!